Vape Radio 54: LIVE from Las Vegas! Vape Summit Brings in Crowds of Cloud-Chasers and More! 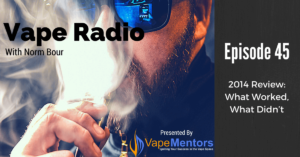 Vape Radio 43: Listen to Phil Busardo, One of the TOP Vape Reviewers Share these thoughts on the Future of Vaping!